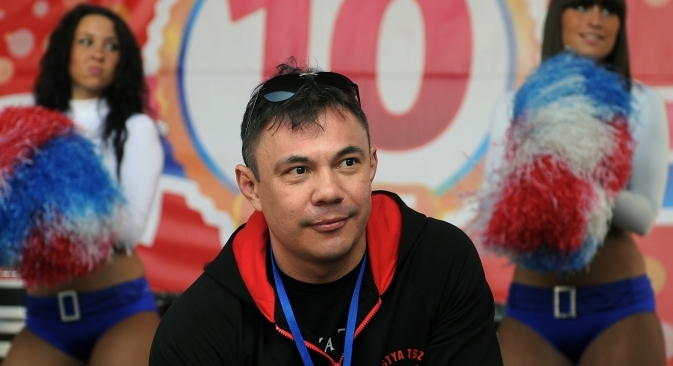 Konstantin “Kostya” Tszyu, himself an erstwhile famed boxer and currently the chief coach of Russian athletes. Source: ITAR-TASS. Former junior welterweight champion Kostya Tszyu, who is currently coaching Alexander Povetkin and Denis Lebedev, speaks of his students’ preparations for the upcoming May 17 title defense fights. Tszyu says he would love to see Povetkin pitted against Ukraine’s boxing legend Wladimir Klitschko. Moscow will host two tune-up fights at once on May 17. World Boxing Association (WBA) cruiserweight champion, Denis Lebedev, will have a face-off with the Panamanian Guillermo Jones, while Alexander Povetkin will be defending his WBA heavyweight title against Andrzej Wawrzyk from Poland. If Povetkin wins his next fight will be with Wladimir Klitschko, WBA, WBO and IBF super champion. Konstantin “Kostya” Tszyu, himself an erstwhile famed boxer and currently the chief coach of both Russian athletes, does not think the Wawrzyk fight will be easy for Povetkin. Gazeta.ru: How is Povetkin progressing in his preparations for the showdown with Wawrzyk? Kostya Tszyu: He’s doing good, preparing himself. There is one week left before the fight but we are on schedule. Gazeta.ru: Is Wawrzyk a serious opponent, particularly in the light of his upcoming fight against Wladimir Klitschko scheduled for late August? K.T. : Wawrzyk has not lost a single fight, he has a good knockout ratio. Despite what many people think, this will not be an easy fight for us. It will be a real title defense. Gazeta.ru: How is Povetkin going to win that fight? K.T. : Alexander will come to the ring and beat his opponent down. It is important to remember that Andrzej is a very aggressive boxer. This is why we are concentrating so much on defensive tactics. Gazeta.ru: Can we perceive the upcoming fight against Wawrzyk as a preparation, a dress rehearsal if you would, for Povetkin’s face-off with Wladimir Klitschko? K.T. : We could say in principle that this will be a test of sorts. I can’t say that it will be an ordinary fight. At this point I do not look further than the fight at hand. Gazeta.ru: Denis Lebedev will be meeting Guillermo Jones on May 17. How is he progressing? K.T. : Everything is fine, our training is on schedule; there are still several sparring sessions to be held. We are ironing out the last nuances, Denis is approaching the peak of his shape. Gazeta.ru: Povetkin and Lebedev will have their fights on the same day. How difficult is it to be preparing two fighters at once for such important events? K.T. : The main difficulty is that they have different styles and approaches. But since they are friends, and because I schedule their coaching sessions for the same time slots, the training process helps me to stay focused. I first work with one of them and then with the other. Gazeta.ru: What was your impression of Wladimir Klitschko’s recent fight against Francesco Pianeta? K.T. : Wladimir has not changed, he sticks to his usual style of dominating the ring and striking a lot. His style might not be particularly varied but what he does, he does very well. Gazeta.ru: A lot of fans and experts dislike the Klitschko brothers’ policy of picking what many believe to be deliberately weaker opponents. Some say that the upcoming Povetkin fight will probably become the first serious meeting in years for the younger brother. Do you agree with this theory? K.T. : A boxer cannot choose and pick his opponents. He has to go through the mandatory title defense procedure. As for the Klitschko brothers’ opponents, it’s just the way it is: at the moment there are not as many boxing stars around as there used to be even in my time. There is a certain vacuum, so [the Klitschkos] have to fight whoever there is. Gazeta.ru: Some say boxing is turning from a sport into an industry and that this is largely the fault of the Klitschko brothers and their managers. K.T. : The culmination of it all, when two men come to the ring and fight it out, is actually about sport. Everything that happens before the fight is indeed about business. I was lucky to realize this early on, when I was still an active boxer, and it helped me to a great extent to reach such widespread popularity in the sport. Not just in boxing, mind you: my face was recognizable to people who did not know the first thing about boxing but even they knew Kostya Tszyu. It is very important to me that both Povetkin and Lebedev reach the same level of popularity. Gazeta.ru: If Povetkin wins against Klitschko, will it be the beginning of the end for the era of the Ukrainian brothers? K.T. : The reality is that younger boxers come and defeat their predecessors. It’s life. Heavyweight boxing is indeed living through the Klitschko era but this will change eventually. Gazeta.ru: Would you like for Povetkin to put an end to that era? K.T. : I would love very much for this fight to take place. I also want Alexander to prove to himself that he can do more, because he did demonstrate a degree of uncertainty in some of his previous fights. Gazeta.ru: Are you comfortable with your status as a coach? Or would you rather prefer to fight again? K.T. : I threw in my towel seven years ago. No, I have no intention of returning to the ring; I’ve paid my dues. It’s the age thing as well, I’m too old now to be proving anything to anyone.